The Dow is one of two major stock indexes. 1. What Are the Differences Between the Dow Jones, NASDAQ & S&P 500? 2. How Do I Read a Stock Index? The Dow Jones Industrial Average and Standard & Poor's 500-Stock Index are both measures of stock price changes. Both are widely misinterpreted as reflecting the fluctuation of overall stock prices or "the market," although both monitor only a selected sample of securities. "The Dow" is widely quoted by newspapers and market commentators. The S&P is more highly regarded by securities industry professionals because of its broader sampling. What is generally referred to as "the Dow Jones average" is actually the industrial component of a series of averages compiled by the company which publishes the Wall Street Journal. The industrial average now has 30 stocks. Founder Charles Dow began it in 1896 with 12 stocks on the New York Stock Exchange. It was expanded in 1916 to 20 stocks and in 1928 to its present 30. Only General Electric remains of the original 12. The DJIA is a "price-weighted average," so higher-priced stocks like IBM have more bearing on its scale than lower-priced issues. A $1 increase in a lower-priced stock can be offset by a $1 decrease in a much higher-priced stock, for instance, even though the cheaper stock had a greater percentage gain. 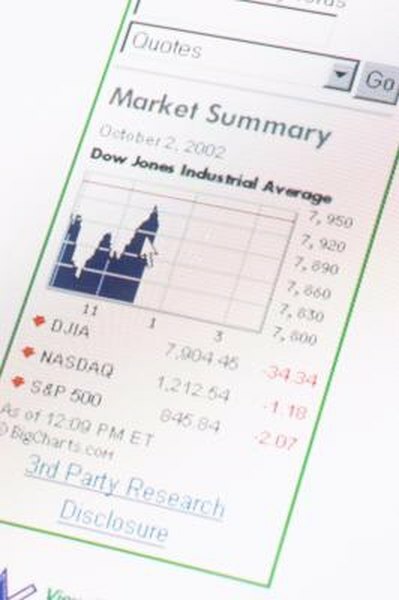 Until 1999 it included only NYSE issues, but now Intel and Microsoft from the NASDAQ market are included. The S&P was created in 1957 by Standard & Poor's, which specializes in reporting on stock market issues and activity. It has a number of stock components, such as industrial, energy, healthcare, utilities and telecommunications. It is a "market capitalization" index, the price of the stock times the number of shares outstanding, so the total value of the company and not just the stock price affect the index. Companies with the most shares are given the heaviest weighting. The S&P stocks are broken into three sections. The top third has 166 stocks, which account for about 75 percent of the entire index. Because it includes more stocks, the S&P is generally regarded as a better indicator of overall market activity. It also encompasses a larger variety of business sectors, while the DJIA is limited to industrial issues. IBM, which is included in both indexes, demonstrates some of the difference. It has the third largest weighting in the S&P but accounts for 12 percent of the weight in the Dow. Its price changes account for only 2 percent of the movement in the S&P but 12 percent of the Dow on any given day. Apple and Microsoft are both in the S&P but only Microsoft is in the Dow.